When you make a booking with us you undertake that you have the authority to accept and do accept these booking conditions on behalf of yourself and your party. A contract will exist upon our accepting any monies from you towards the booking or upon the issue of our Confirmation/Invoice, whichever is the earlier. These conditions in conjunction with the information set out in our published information form the entire agreement between yourself and ourselves. When you make a booking with Eco Travel Vietnam Ltd., Co and we accept it, the total cost of the holiday becomes payable immediately, unless we have agreed that you should pay a deposit initially. In any case, the minimum amount payable upon booking is the 30% of the total package price or USD200 per person whichever is the greater. A confirmation invoice will then be sent to you. 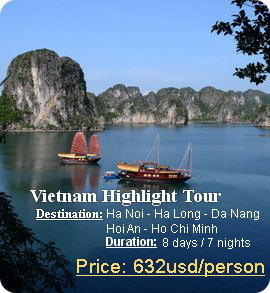 The full balance of your holiday must be paid at our office when you arrive Viet Nam by credit card or cash. Prices are fixed at the time of booking and generally will not be subject to surcharges. The only exception to this will be an increase in our costs arising as a result of any government action including but not limited to new or increased taxes such as VAT. We are licensed by Vietnam National Administration of Tourism number 0701. This ensures that in the event of our failure your money will be protected; if you are on holiday at the time, arrangements will be made for you to complete your holiday and return home. The flights we provide are supplied by other Vietnam airline holders and are protected by their bonds. If you wish to change your Tour booking with Eco Travel Vietnam Ltd., Co. in any way and we can accept the change, we reserve the right to make a charge of USD10.00 per person per amendment. Where changes are not possible without additional costs being incurred we will advise you of the cost of the change and require your acceptance before implemeting the change. Please note that where your booking with Eco Travel Vietnam Ltd., Co. includes domestic flight tickets in Vietnam countries, Eco Travel Vietnam Ltd., Co. acts as an agent for the airline or flight consolidator in a ‘split-contract’ arrangement. Changes to your air tickets will incur airline or flight consolidators’ amendment charges. Where amendment to air tickets is possible Eco Travel Vietnam Ltd., Co. will make an amendment charge of USD30 per ticket in addition to any amendment charges levied by the airline or flight consolidator. + You or any member of your party may cancel all or part of your tour at any time providing that the cancellation is made in writing to us by the person who made the original tour booking. You will receive a refund of the full cost of your booking less the cancellation fees specified below. In exceptional circumstances it is necessary for us to incur costs on your behalf to secure accommodation or other services in advance of the 30-day deadline. We reserve the right to with hold refund of these costs, even if you cancel before the 30 day deadline. + You will have to pay 15% on the total price of the tour together with the bank fees result from this cancellation when you make your cancel of the tour booking before 15 days since the starting day of the land tour. + You will have to pay 25% on the total price of the tour plus bank fees if you cancel your booking with us before 10 days since the starting day of the land tour. + You will loose all your deposit with us if you cancel later 5 days since the starting day of the land tour. + In case there are several weather conditions we will discuss and offer you to have an alternative program with equivalent services’ quality of old program. Otherwise we will refund you a part of the cost. We will not accept to have to pay any compensation for over fees on the total cost we received from you. We do our very best to ensure that your tour arrangements go according to plan. However, if you have a complaint arising out of what we have agreed to provide for you please let us know at the earliest opportunity, if necessary by telephoning our office from wherever you may be. If a problem arises during your Holiday or Tour it is important that you advise our representative at the earliest opportunity who will endeavour to put things right. Your letter will be given prompt attention. If you fail to follow this simple procedure we cannot accept responsibility, as we would have been deprived of the opportunity to investigate the matter and where possible rectify any problem. FREE CHARGE for under 2 years old. From 2 – 9 years old, 30% discounts . From 10 up, full charge will be applied. Information you give us. When you make a tour request, we will ask for personal information: your full name, country, phone number, email address, number of guests travelling with you, your tour information (traveling period, flights information, destinations) and any other special request you might choose. You will get in touch with our team, and give us more information in order to customize your tour, we will collect information from here too. You will also send us your group information (name list, date of birth, passport number, room list). Information you give us about others. Sometimes you will make tour booking for others, we will receive their information too. Your responsibility is to make sure that the person or people you represented are aware of and accept the way Eco Nature Travel use their information. Information we get from your use of our services: We collect your IP address. Tour: We need your information in order to book services from our partners during your tour, this is the reason why we exist. Sending you travel news and latest promotions, special offers by using your contact information. Depending on your personal information and your booking history, special offers will be sent to your email address. Press Room: We may use your non-personally information for our press room. For example, we may show trends about tourism, destinations, and so on. Exchanging email, texts, calls history. Your feedback and reviews about the tour. Travel news sent to your email. Legality: In some cases, we might have to use your information for solving legal disputes, investigations or other legal problems. Third-parties: Your information (Group Leader’s full name, number of group members and other special requests) will be sent to other partners such as restaurants. Payment service providers: During your online payment process, you will share the card details in order to complete the payment and your reservation. Executing law, regulation, legal process requested by the government. Enforce applicable Terms and Conditions of Service, including preventing, detecting or prosecuting of criminal acts and fraud. Protect and defend our rights or properties, the rights of our guests or any other business partner of us, as required by law. To perform the contract between you and us, we might need your information to complete and manage your booking. We might use your information to provide a better performance, such as the most relevant content, emails, promotion. All of your personal information for marketing purpose will be used under your permission. Your information will be stored in our internal system of customers. We will delete it immediately if you request. Eco Travel Co., Ltd takes responsible for the processing of personal information on www.ecotravelvietnam.com website. Please kindly email us through gotoeco@dng.vnn.vn for any comments or additions to this policy for information security. We encrypt many of your information using SSL. We review the information we collect, storage and protect it from unauthorized access, including physical security measures.